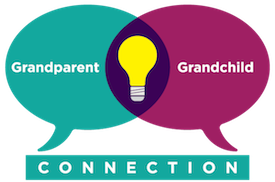 Grandparents often ask me, “How will I be remembered?” They know that they can leave valuables, but things can be lost, discarded or no longer considered valuable. A legacy of values, however, can guide grandchildren in their daily life, school, friendship, family relationships. A value such as kindness becomes integrated into the being of the grandchild’s personality. It can be forever and it can be shared and taught to other members of the family and friends. It is part of the Teaching-and-Learning culture of the family, and the grandchild’s world outside of the family. Interestingly, delving into Values often helps people to discover unexpected areas of commonality, notwithstanding what may appear to be striking differences of opinion. Some families, for example, are very much split along political or ideological lines. There’s nothing wrong with healthy disagreement and debate, of course – it’s all part of a vibrant Teaching-and-Learning culture. But if, for example, social justice emerges as a strong core value for all or most family members, there are ways to share and live this that are decidedly nonpartisan. Families across the political spectrum, or with different religious beliefs or practices, can volunteer together in a soup kitchen or community renewal project, and share articles or books that inspire them. Why do a Family Values Quiz? Often values are unspoken or assumed, or manifest in different ways. They are based on where or how you were raised. Your children may have been raised in the same home, but connected with different values. They are now married and building their own family values. So what happens when all of these different values come together? For us, the Family Values Quiz was a way to see the overlap, and to provide a framework for a deeper conversation about values. The results provided a map or lens for conversation. We know, too, that values and priorities are things that constantly change, so that’s why this discussion needs to be reviewed periodically to see where we are. The Family Values Quiz can be a family meeting agenda item or it can be emailed in advance. First, I’ll share a copy of the quiz, and then, some insights to practical applications…what does it look like in everyday life to value adventure or generosity? I’m not saying that this is an easy, clean, one-time process. But I do say always leave your campsite better than you found it; leave your school better than you found it, and leave your neighborhood and community better than you found it. It is within your power to leave your family with greater meaning, and the world a better place, because your family was in it. The discussion around values is a step to making that happen. So how do you discover family members’ values? We started with a short, stimulating quiz as an agenda item at our inaugural Family Meeting. A sample of that quiz follows. Keep in mind, this is not a test. Rather it’s a thought starter around possible values as a basis for discussion, to see where values intersect, diverge, overlap. My granddaughter Katie has suggested a different ‘ranking scale’ might work for some families. “Aside from a couple that are more of a personal preference, I have a hard time believing that anyone would willingly put ‘not important’ to most of these… thus making it harder to find the top priorities.” It may be in the practical application where priorities emerge. Have fun taking the quiz, tallying the results and discussing them. What will emerge is a kind of treasure map for your family life – a picture of the many rich attributes and values, interests and convictions, that each of you contributes to the collective, to make it a vibrant whole. It may be tempting, initially, to try and define your family ethos by zeroing in on shared interests, or things that everyone likes to do together for fun. And, admittedly, focusing on the fun things first can provide an opening for the deeper values conversation. For example, a family where many members enjoy swimming may find that they share an affinity for environmental issues; or a family that enjoys playing chess may be interested in strategy and how that informs politics and democracy. Families who have fun cooking, at a minimum may boast better treats at their meetings, but may also find an underlying concern for food equity or supporting locally owned businesses. But interests, hobbies and activities, for a host of reasons, may wax and wane through the years. Core values, however, tend to endure – and they are frequently the foundation for our lasting passions and enthusiasms. A family with a core value of “outdoor adventures and fitness,” for example, may relish taking ski trips together each winter. But what happens during years when money is tight, or when a good portion of the family’s members are either too old or too young to participate? Everyone can still have fun together, and fulfill the very same core value, by going (or watching!) sledding or ice-skating in a local park. By exploring and coming to terms with our family’s areas of commonality and separateness, we teach the youngest generation how people of different beliefs respect each other, value each other’s contributions, and manage to get along in the world.